To Cite: Nouri S, Sharif M R, Sahba S. The Effect of Ferric Chloride on Superficial Bleeding, Trauma Mon. 2015 ; 20(1):e18042. doi: 10.5812/traumamon.18042. Background: Controlling superficial bleeding, despite all the progress in surgical science, is still a challenge in some settings. Objectives: This study assesses the hemostatic effects of ferric chloride and compares it with the standard method (suturing technique) to control superficial bleeding. Materials and Methods: In this animal model study, 60 male Wistar rats were used. An incision, 2 cm long and 0.5 cm deep was made on rat skin and the hemostasis time was recorded using ferric chloride at different concentrations (5%, 10%, 15%, 25%, and 50%) and then using a control (i.e. 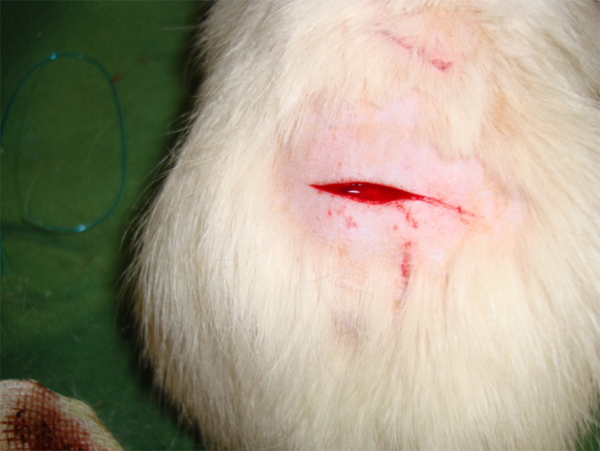 control of bleeding by suturing). The skin tissue was examined for pathological changes. Finally, the obtained data were entered into SPSS (ver. 16) and analyzed using Kruskal-Wallis test, Mann-Whitney, Kolmogorov-Smirnov, and Wilcoxon signed ranks test. Results: The hemostasis time for the ferric chloride concentration group was significantly less than for the control group (P < 0.001). Conclusions: Ferric chloride may be an effective hemostatic agent to control superficial bleeding in rats. Controlling superficial bleeding, may be a challenge in certain settings; more effective methods to control superficial bleeding are still sought. There are many ways to control superficial bleeding namely sutures, direct pressure, elevation of the extremity above the level of the heart, pressure bandages, and tourniquets (1). Topical agents, which act by stimulating hemostasis at the cut surface of the skin, are other ways to control bleeding (2, 3). Ferric chloride (Fecl3) is a chemical agent. This agent is dark brown and has acidic properties. Ferric chloride is widely used in water purifiers as a protein coagulant (4). This property of ferric chloride with respect to the significant amount of proteins in blood makes ferric chloride a strong hemostatic agent. It was used for the first time for research as an arterial thrombotic agent in an animal model study (5). Nevertheless, its hemostatic effects have not been compared with standard methods in an experimental study. Ferric chloride exerts its effects with agglutination of proteins in the blood. In fact, chloride and ferric ions in this compound react with proteins of the blood, causing the proteins to coagulate. These coagulated proteins close the openings of small capillaries (6). Ferric chloride, unlike other known hemostatic agents, exerts its hemostatic effects via a chemical reaction with the blood. This property makes ferric chloride an efficient hemostatic agent that does not depend upon a normal hemostatic system to exert its effect (7, 8). Since most topical hemostatic agents are used to control superficial bleeding, required normal homeostatic functions to exert their effects, the introduction of a local hemostatic agent, which does not need a normal hemostatic system, and can enhance local hemostatic agents. This study sought to assess the hemostatic effects of ferric chloride and compare them with the standard method (suturing) on superficial bleeding. This study was conducted at the Kashan University of Medical Sciences from August 2013 to December 2013 using 60 male Wistar rats weighing 180-230 g; they were randomly divided in six groups with each group having ten rats. All animals received care in compliance with the American Convention on Animal Care and the study was approved by the Institutional Ethics Committee at our university. 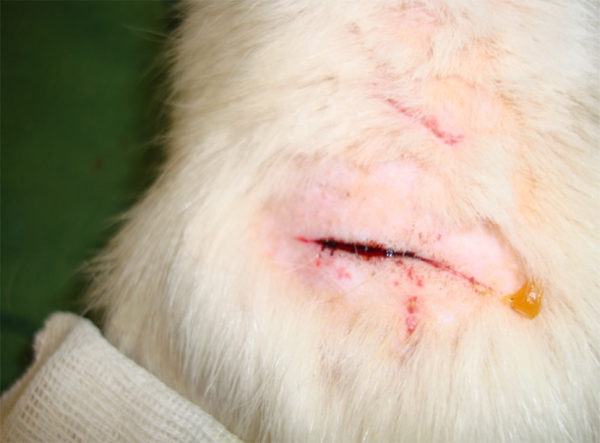 One week before the study, all rats were kept and fed in the same way and after this period, an incision with a length of 2 cm and a depth of 0.5 cm was performed on each rat using a scalpel (Figure 1). Then, ferric chloride was applied in concentrations of 50%, 25%, 15%, 10%, and 5% to the incision on the skin by a swab. The same swab was used to remove the same amount of solution on each application. Various concentrations of ferric chloride was in our groups and the times of homeostasis were measured by a chronometer. In this study, the hemostatic time was considered the time required for complete cessation of bleeding and no blood discharge from the incision site (Figure 2). The mean of obtained 10 measurements was considered as the hemostatic time for each concentration. The standard method used to control superficial bleeding was suturing, which was used for the control group for comparison with the ferric chloride concentrations. The time of external hemostasis was measured after suturing and all sutures were performed by one surgeon on the skin of ten rats, which were kept and fed in the same way as in the other groups. Each rat was injected intraperitoneally with 50 mg of cephalothin to prevent infection. Finally, after three days, the rats were anesthetized with ketamine (10 mg/kg) and were placed prone on the operating table. The previous site of rat’s skin was resected and immediately fixed in formalin, then sent to the laboratory for the pathological assessment. At the same time, three normal rat skin samples (i.e. did not receive ferric chloride or suturing) were sent to the laboratory and compared to the ferric chloride and suture groups. Based on the defined pathological grading, the pathology result were classified into six groups as follows: 0) No change; 1) Minor inflammatory infiltration without edema; 2) Mild to moderate inflammatory infiltration with mild edema; 3) Mild to moderate inflammatory infiltration and moderate edema; 4) Moderate inflammation with neutrophils scattered and diffuse edema; or 5) Severe inflammation of the tissue, edematous changes, fibrosis, and hemorrhage. The obtained data was entered into SPSS (ver. 16). According to the abnormal distribution of variables in the Kolmogorov-Smirnov test, the data was analyzed using Kruskal-Wallis test, Mann-Whitney, and Wilcoxon signed ranks test. P < 0.05 was considered significant. Table 1 shows the hemostatic time for the six groups. In all groups, we recorded complete hemostasis and the time in the six groups showed a significant difference (P < 0.001). Between ferric chloride concentration groups and the control group, there were significant differences and the hemostatic times for different concentrations of ferric chloride were significantly less than the control group (P < 0.001). The pathological examination indicated the most common pathological grade at concentrations of 5%, 10%, and 15% ferric chloride groups and the suture group; and 60% and 80%, of the rat skins were observed as grade two in the 25% and 50% ferric chloride. Grade zero, three, four, and five were not recorded for any of the study groups (Table 2). In this study, the obtained data showed that ferric chloride compared to the current standard method, which includes suturing the bleeding site, needs significantly less time to control bleeding with even the lowest concentration of ferric chloride used. Local agents, which are used for superficial bleeding hemostasis, stimulate hemostasis on the incision surface. In fact, to exert their functions they require normal homeostatic systems, which is a disadvantage for this drug class, because some such as cirrhosis of the liver due to liver dysfunction that impairs the body’s homeostatic functions (9). Few studies have been conducted on local hemostatic agents that indicate the usefulness of these materials for reducing hemostatic time and the patients requirement for blood and blood product transfusions (10-12). Ferric chloride, unlike other known hemostatic agents, exerts a hemostatic effect via a chemical reaction with the blood. This property makes ferric chloride an efficient hemostatic agent that does not need a normal body hemostatic system to exert its effects (13). Additionally, the acidic properties of ferric chloride should be considered, too; as this chemical agent, when reacting with blood proteins, creates a barrier by preventing the outflow of coagulated proteins into the blood from the vessels. On the other hand, it prevents ferric chloride from entering the vessels and prevents other potential systemic complications from ferric chloride (13). Ferric chloride should be considered to induce oxidative damages to the vascular cells. In fact, ferric chloride triggers vascular wall injuries and denudation of the endothelium via a mechanism that involves the generation of reactive oxygen species and induces the amount of microparticles in the circulation (14-16). Other studies have shown that ferric chloride-injury induced the release of endothelial cells derived from ferric chloride-filled ‘‘buds’’ that are rich in tissue factors and may contribute to thrombosis (17). It has been shown that the concentration of ferric chloride is an important component for the injury response in rat models by influencing the level of endothelial injury and microparticles released after exposing the vessel to oxidative stress (18). In addition, the use of different concentrations of ferric chloride attempted to send skin tissues after exposure to the ferric chloride for pathological exam and the pathological effects of this hemostatic agent were evaluated in this study. A pathological grading was used to determine the inflammation of the skin, which is caused by exposure to ferric chloride as a foreign body. This grading, according to the severity of the inflammation was scored from zero to five by an experienced pathologist. The pathology report showed that ferric chloride, even at a high concentration (50%), did not cause inflammation greater than grade two and immune system reaction to this hemostatic agent did not differ much from the standard method (suturing) used to control superficial bleeding. Nouri et al. was seeking a hemostatic effect from ferric sulfate, which acts like ferric chloride, on superficial bleeding. They have reported that ferric sulfate is an effective hemostatic agent and further noted that the skin tissue of the Wistar rats had a slight inflammatory reaction with ferric sulfate as a foreign body (19). Pathological changes from Nouri et al. study was consistent with our study. Kim and Rethnam stated that a good hemostatic material is one that stops bleeding in the shortest possible time, is easily portable and compatible with life, imposes minimum complications to the patient, does not interfere with tissue healing, and has a reasonable price (20). The unique features of ferric chloride mentioned, such as not requiring normal hemostatic system to function unlike other hemostatic agents makes this chemical substance an effective topical hemostatic agent for the control of superficial bleeding. This article was an MD dissertation, approved by the research council at the Kashan University of Medical Sciences, with grant number 9378. We thank all participants and those who assisted us in this study. Authors’ Contributions: Saeed Nouri: acquisition of data, analysis, interpretation of data, study supervision, study concept and design statistical analysis. Mohammad Reza Sharif: drafting the manuscript, critical revision of the manuscript for important intellectual content, administrative, technical, and material support. Sare Sahba: drafting the manuscript and critical revision of the manuscript for important intellectual content. Funding/Support: Financial support and supervision was provided from the Vice Chancellor for Research of the Kashan University of Medical Sciences.